Widespread cracking of stucco cladding caused by post-tensioned creep of supporting structure. Panelized brick deflection caused by post-tensioned creep of supporting structure. 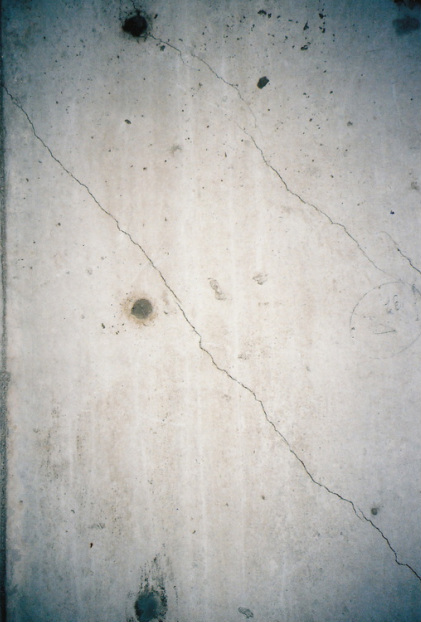 Sub-grade concrete wall cracking resulting from post-tensioned structure creep. All basic structural systems have dynamic behaviors, which are to a fair degree predictable. The detrimental effect of this on exterior building envelopes is greatly under-estimated by many construction professionals. PL:BECS has documented innumerable examples of building claddings being deflected, cracked, and otherwise damaged. Such observations have included recurring experiences with wood-framed buildings, normally-reinforced, post-tensioned and pre-stressed concrete structures, steel-frame structures with post-tensioned concrete floors, etc. Such structurally-related interactions are a far more frequent factor in building envelope problems than is generally acknowledged. PL:BECS, while not a structural engineering firm, has extensive experience as well as deep understanding of basic structural design, as well as a particular familiarity with the inherent behavior of materials and structural systems. This expertise is exceedingly useful in evaluating problems with existing buildings, as well as in formulating recommendations for buildings in design.